PROJECT SUMMARY: This home has it all! Beautiful white brick home, detached garage and study, enormous paver patio with outdoor kitchen and fireplace, paver driveway, beautiful landscaping, and the list goes on and on. We didn’t even mention the inside of the home! These clients love to entertain, so choosing the right lighting designer that could help make the property at night look as cool as the place is during the day was important. LANDSCAPE LIGHTING FOCUS: The main landscape lighting focus on phase I was to ensure instant curb appeal from the street: front elevation of home, front paver walkway, trees in the front yard, garage, brick walls on the inside of driveway, and the paver driveway itself. Phase II brought the backyard into the picture, highlighting the paver patio, fireplace, outdoor kitchen, backyard elevations of the home and detached garage, and a few selected trees to help give the space some depth at night. Landscape lighting really allows us to capture the space in a more intimate and natural way than traditional line voltage (120v) flood lights. 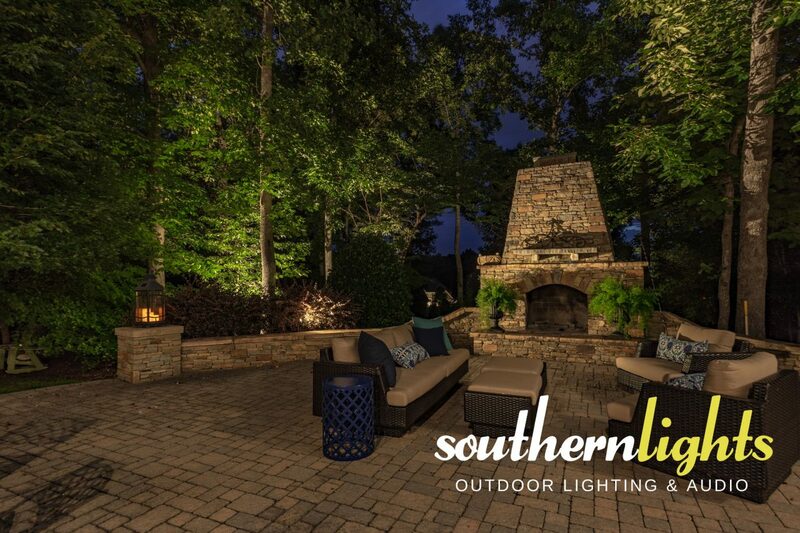 Accent landscape lighting helps create drama and detail on architecture and warmth to the landscape. LOCATION: The lighting designs and installation for this project can be found Henson Forest, Summerfield, NC 27358. Southern Lights tackled this design and installation in 2 phases over a year and a half time span. The driveway and garage areas were overly dark due to the tall privacy brick walls. Getting fixtures installed into the paver driveway was not necessarily easy. Southern Lights had to pull out the outer border of pavers to run our landscape lighting wire to the desired location of the fixtures. After fixtures were located, the pavers then had to be cut with a concrete saw to custom install each fixture as if it were always meant to be there. Again, on the driveway side of this home, dormers were needing to be illuminated to help carry the landscape lighting effect across the architecture evenly. Custom gutter mounted fixtures were utilized to highlight the dormers. On the same section of the home sat 1 set of garage doors that were also very dark and ominous, so carry attention was placed in installing soffit lights above each garage casting a very nice soft effect across the garage and spilling onto the paver driveway.